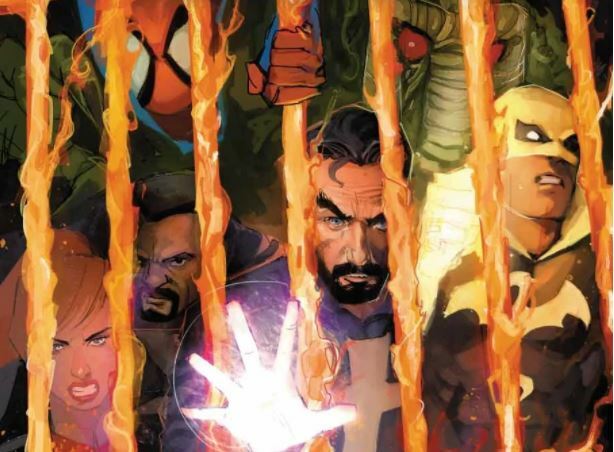 Doctor Strange: Damnation #4 Review – AiPT! Fantastic art, great character development and future possibilities for two characters, but nothing else. “Damnation” comes to an inevitable end, the games wind down, and all the chess pieces are put back in boxes. The only question is whether the pieces end up in the right boxes and what implications these supernatural shake-ups have going forward. There are over ten anti-hero types involved in this story, many of whom have their books cross over with this event. This is also a direct follow-up to Secret Empire. More importantly to Doctor Strange, the impasse between him and Wong that has lasted for almost a year finally comes to a head. Every man for himself. About how it usually goes in Vegas. This issue is mostly driven by the art, which appears to be painted and perfectly captures the eerie and surreal nature of the fight that is going on between the Midnight Sons and Avengers. Reis and Kudranski each put in a bit of time in previous issues in this series, but I think for the conclusion going with Reis’ style for the main story was a great fit. The series of pages where Strange gets the powers of the Avengers is almost surreal, in particular when he harnesses T’Challa’s abilities. It also becomes more effective and stands out further when a backup story is added as an epilogue of sorts that goes back to Kudranski’s more “conventional” art style. Wong also got to gloat quite a bit in this story. After setting the stage for this whole operation against Mephisto and the odds seemingly stacked against him, he not only manages to save his friend but also gets to show how much he has evolved and stepped out of Strange’s shadow through his ingenuity and stoic, calm fearlessness. There’s one sequence where a fully restored Strange tries to save Wong from a fiery pit, and in a move symbolic of how much he’s finally been able to step out of Strange’s shadow, Wong just lets himself fall into Hell as he has other business there. While he probably needs to be fleshed out a bit more, I think the time has never been better for Wong to get his own series. Lastly, seeing Ghost Rider running Hell and that last shot of him facing down Mephisto with his own army is epic and invites numerous possibilities. Cates is actually launching a brand new Ghost Rider book, but sadly it’s not going to star Johnny Blaze. I can only hope there may be a tie-in given he’s got his hands in both stories. Wong has no sympathy for the Devil. Unfortunately, it’s far from it. The other problem I had was that for all the hype built up for this event, at the end of the day there were no real overarching status quo changes beyond a new ruler of Hell. We all knew that there wouldn’t be major changes happening anyway, since solicits for future issues starring almost all of these heroes had already come out and didn’t indicate anything about any of them residing in hell (well, other than one guy). But other than that, while each hero/vigilante/character had their own side struggles that seemed to intersect with this event, in the end Las Vegas was saved, the Avengers and Strange were restored, and life went on. So, we went through all this for what exactly? In hindsight, I wonder if the main series of this event was even necessary. Having had a chance to read all the “tie-in” books for this event (all of which were decent to amazing), I don’t see why the pages from Damnation couldn’t have just been incorporated into the other books (and in some cases, they already were!). I think the $4.99 premium price tag is probably why. Sorry Marvel, but when you’re just doing a shameless money grab here I’m going to call you out. No. The art is fantastic, you get some great character development and future possibilities for two characters, but the ball is dropped for everyone and everything else involved in this story. Doctor Strange #389, the conclusion of this event, is a far superior take on how this battle ended (and it’s hard to believe it’s written by one of the co-authors of this issue given the stark contrast in quality). Pick that up instead (and you can’t go wrong picking up any of the tie-ins, honestly) but there’s no need to spend your money on the main series here (more expensive price tag notwithstanding). The art perfectly captures the eerie and surreal nature of the fight that is going on between the Midnight Sons and Avengers. Wong and Johnny Blaze were written in ways that expand future possibilities for their stories going forward. This was probably the most ineffectual and pathetic the once menacing and threatening Mephisto has ever been made to look. With the focus on a few main characters, the entire all-star cast brought in was turned into a collective afterthought. The title character's status quo literally did not change at all.